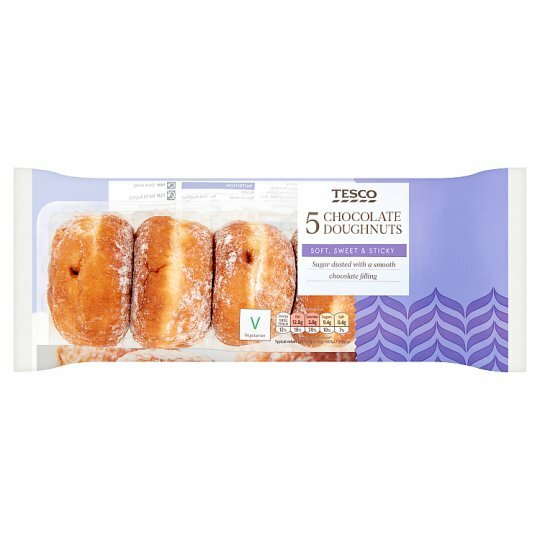 5 Doughnuts with chocolate flavoured filling. Wheat Flour (Wheat Flour, Calcium Carbonate, Iron, Niacin, Thiamin), Water, Chocolate Flavoured Filling (18%), Palm Oil, Rapeseed Oil, Dextrose, Sugar, Yeast, Milk Proteins, Raising Agents (Disodium Diphosphate, Potassium Bicarbonate), Emulsifiers (Mono- and Di-Glycerides of Fatty Acids, Sodium Stearoyl-2-Lactylate, Mono- and Di-Acetyl Tartaric Acid Esters of Mono- and Di-Glycerides of Fatty Acids), Salt, Cornflour, Thickener (Sodium Carboxymethylcellulose), Flour Treatment Agent (Ascorbic Acid). Chocolate Flavoured Filling contains: Sugar, Sunflower Oil, Rapeseed Oil, Dried Whole Milk, Fat Reduced Cocoa Powder, Cocoa Mass, Emulsifier (Soya Lecithins). For allergens, including cereals containing gluten, see ingredients in bold Also, may contain peanuts, nuts, sesame seeds and egg. Store in a cool, dry place and once opened in an airtight container. Not suitable for home freezing.